We truly feel lucky to be working in real estate on the Oregon coast. Some of the areas we get to go to, and some of the homes we get to see, make this such an amazing place to work. We have plenty of favorite ocean front spots but this one’s got to be near the top our list. 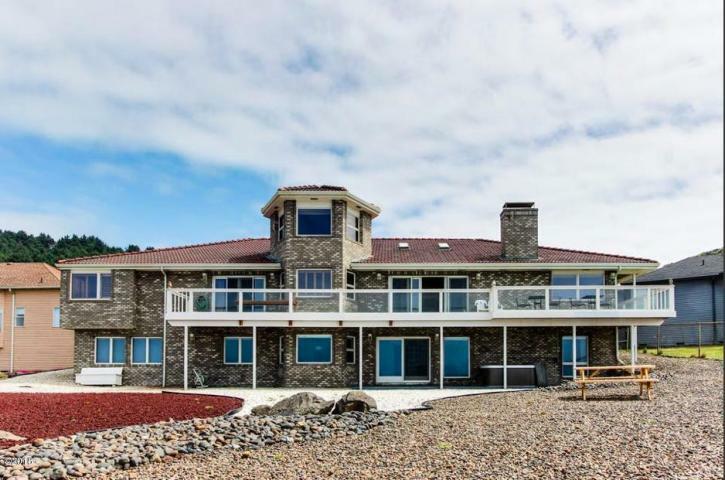 Newport Oceanfront Estate has stunning views of the Pacific, and from the yard, even views of the historic Yaquina Head Lighthouse. The estate is in the north part of Newport, at 626 NW 54th Ct, Newport, OR 97365. Sitting on a peaceful cliff the views are elevated, making them even more impressive. 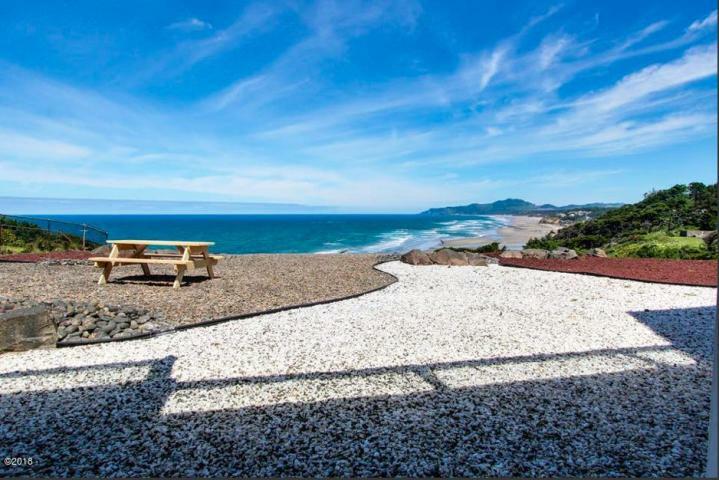 The home is situated to take advantage of the wonderful Oregon coastline between Newport and Lincoln City. Newport Oceanfront Estate is a successful vacation rental with Vacasa Vacation Rentals, the owner enjoys steady income with a unique payment structure developed by Vacasa. For an investor looking for a good cap rate, this Newport ocean front home should be considered. Financials are available for interested parties. The estate comes fully furnished and turnkey as a vacation rental investment opportunity. Newport Oceanfront Estate is ideal for a family reunion or a large group trip, this recently renovated, dog-friendly, 6,000 square foot, eight-bedroom Newport vacation rental is packed with entertainment amenities, skylights, gorgeous oceanfront views, and ample space for everyone to unwind and relax and is on a 1/2 acre lot. There's even a separate unit that has its own kitchen, bedroom and full bath. Located oceanfront and right near the Yaquina Head Outstanding Natural Area on a quiet dead-end street, you'll be right near the sandy beach, an historic lighthouse, and several walking trails. This home includes use of a private crabbing and fishing dock complete with a cleaning and cooking station. Crabbing boat and crab ring rentals also available. Dinners in will be no problem here! You'll have a full kitchen on each level of the main house - and there's no need to worry about a lengthy clean-ups here, there's a dishwasher too. 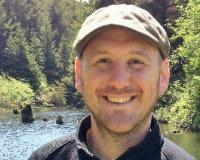 You can make cioppino or fish tacos for a crowd! Of course, Newport has a number of great restaurants, so you could easily spend your trip here using the kitchen for nothing more than quick breakfasts and movie night snacks. On nice summer afternoons, everyone will want to be out on the patio of this Newport getaway, enjoying the oceanfront views and socializing, while the grill master prepares a feast. This finished outdoor space is also wonderful for morning coffee, lazy afternoon reading, relaxing in the hot tub, or just admiring the spectacular Pacific Ocean view. Keep a close eye out for the resident Gray Whales. 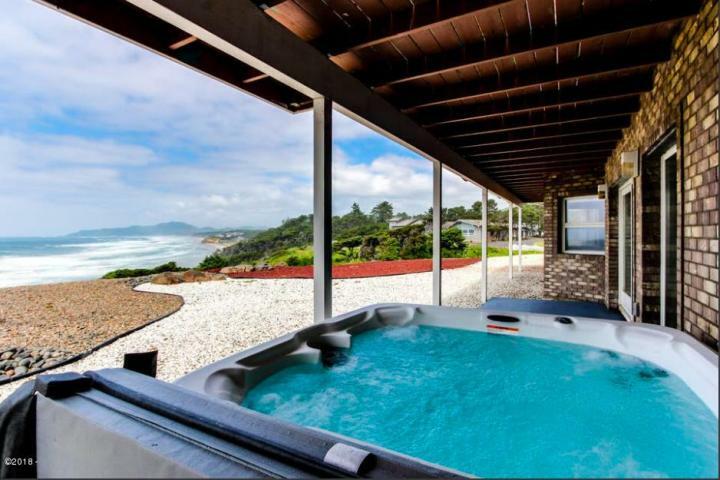 View more here, at the real estate listing for this great home, and view the vacation rental listing as well. Don't miss the virtual walkthrough tour either. Call to schedule an exclusive tour of this fantastic rental investment property in Newport, Oregon today.